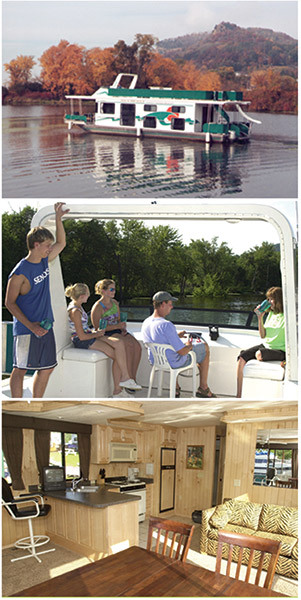 Enjoy a houseboat vacation on the Mississippi River with Fun ’N the Sun houseboats! As the captain of your own houseboat, you’ll enjoy the freedom of exploring the Mississippi River at your own pace. On your Fun ’N the Sun houseboat vacation you’ll enjoy sandy Mississippi River beaches, historic river towns, unparalleled scenery, and excellent fishing. Our houseboats are custom built with your comfort in mind: you’ll have everything you need, plus additional luxuries to make the trip even more enjoyable. Contact Fun ’N the Sun or visit us on Facebook to plan your houseboat vacation on the Mississippi River today!